We hope to answer any questions you have here, if you don't find out what you wanted to know, please use our contact form to get in touch and we'll try to help you. Click on the blue headings below to reveal more information. Why must I filter and disinfect the water throughout the whole home? Many people filter their drinking water at the tap, but this is not enough: bathing and showering, and even brushing your teeth in untreated water exposes you and your family to volatile harmful chemicals and microorganisms. Volative harmful chemicals can be absorbed by inhalation, throught the skin or orally. The rate of absorbtion and exposure to the harmful chemicals increases with warm water and children and the elderly are even more at risk than adults. The body needs between six and eight 250ml glasses of HEALTHY water per day (tea, coffee, alcohol, juice and sodas DON'T count). Some of the problems treated and alleviated with adequate HEALTHY water intake are: asthma, allergies, constipation, hypertension, high cholesterol, headaches, migraines, low back pain, rheumatoid arthritis, angina and cramp-like leg pain. How do CRYSTAL FLOW™ filters work? 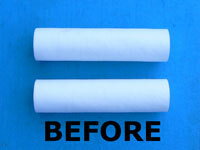 Our filters work in stages to remove unwanted materials from water. The first stage, or pre-filter stage, removes suspended sediment, such as sand particles and dirt, from the water. The cartridge filter is made from spun-bonded polypropylene, which removes all suspended solids larger than 20µm in size. The water then passes through an Activated Carbon filter, which further filters the water and removes organic, chlorine and chlorine compounds, herbicides, pesticides, phenols, turbidity, colour, bad taste and odour. Our filters are extremely efficient. You will be astounded when you see what they remove from supposedly "treated" water that you buy from the municipality. Using a CRYSTAL FLOW™ purifying system ensures that the muck you see in the "AFTER" picture on the right does not get into your body. Our water filters remove the impurities so your liver and kidneys don't have to. What are the advantages of using UV for the disinfection of water? The life span of the filter cartridges cannot be pre-determined or guaranteed, as it depends entirely on the specific circumstances. The sediment filter stops the suspended dirt in the water, which to some degree protects the carbon filter from clogging, thus prolonging it's life span. 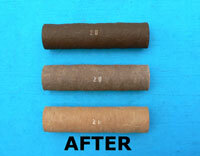 Change the sediment filter when visibly dirty or when the water pressure drops. What is Ultra Violet (UV) disinfection and how does it work? UV light kills bacteria, viruses and some cysts (dormant forms of bacteria). Exposing the bacteria in water to UV light interferes with their RNA and DNA replication, killing them. Any microorganisms that might survive in the water are sterilised so that they can not replicate, making it impossible for them to cause an infection. UV light is a frequency of light found in sunlight, between visible and X-rays in the spectrum and is not visible to the human eye. It has long been known that sunlight kills germs and fungi. We use artificial UV light in our UV reactors. WARNING: UV light is harmful to eyes and exposed skin. NEVER EXPOSE YOURSELF TO UV LIGHT WHEN THE LAMP IS SWITCHED ON. Before any system can be designed it is vital to ascertain the amount of water that is to be treated and irradiated within a certain time frame. This is defined as the flow rate, expressed in litres per hour (l/h) - or in cubic meters per hour (m³/h) for higher flow rates. Always design systems for the actual peak demand, which means the highest possible litres per hour to be radiated during any 24-hour period. To ensure that all microorganisms receive the correct UV intensity for the necessary length of time and thus reliable disinfection taking place, the turbulence within the reactor must be optimized. This will prevent the microorganisms from short circuiting the required flow path. It is therefore crucial that the correct dimensions and hydraulic characteristics are incorporated into the reactor at design stage, otherwise optimum turbulence may not be achieved at minimum demand levels. A bacteriological examination of the water to be treated must be performed to detect sewage pollution of the water. As a general rule, water contains many types of relatively harmless saprophytes, which normally inhabit the soil, air and water. However, both ground and surface water may be contaminated by domestic sewage, which may contain human pathogens, such as Typhoid, Dysentery, Hepatitis, Diarrhea and Cholera. These viruses or bacteria are considered to be of faecal origin. Contrary to common belief, no examinations are made to detect specific pathogenic microorganisms. The routine bacteriological analysis is based on the approximate determination of the total numbers of organisms present, plus the presence or absence of the more common organisms of intestinal or sewage origin. The most common are the bacteria of the coliform group and they are therefore singled out to serve as index organisms of faecal pollution. The prevalent species are the various strains of Escherichia coli, followed by Enterobacter aerogenes. The advantage of testing for these organisms rather than for specific pathogens is that the coliform organisms are constantly present in both healthy and diseased humans in large numbers, billions are excreted daily by the average person. It is estimated that for every Typhoid bacillus or other pathogens e.g. viruses of Polio or Hepatitis in polluted water supplies, there are usually millions of coliform organisms, especially E. coli. Another advantage is that the coliform group survives for longer in an aquatic environment than do most other intestinal pathogens. In addition, the presence of these organisms is easily detected using a relatively quick method, in contrast to the more tedious, time consuming identification of a specific pathogen. For complete termination, different pathogens need specific UV doses. In general, a determination is made of the UV dose required to terminate E. coli. This is the basis for all other system-design calculations. For low-pressure lamp systems the temperature of the water to be treated should fall into the range of 5°C to 30°C with optimum efficiency at 19°C. The ultimate amount of UV light that will pass through a volume of water depends on several factors, which relate to the physical properties of both the UV radiation and the water. The UV intensity at the lamp surface effects how far into the volume of water the radiation will be able to travel. Due to the inclusions of both organic and inorganic substances either suspended or dissolved in the water the UV light will either be absorbed or deflected by the inclusions. This creates shadow areas within the reactor because of the rectilinear nature of the UV light's propagation. This must be corrected by providing the proper turbulence (see again: Flow and Turbulence). The discolouration of water is in most instances caused by the presence of minute particles of organic matter. Surface water usually contains complex organic molecules known as Humic and Fluvic acids, which shows as a brownish discolouration. These molecules absorb UV light. Measuring devices available read the rate of absorption of visible light, meaning that water that appears very clear might still have a high UV light absorption potential. Organic matter should be limited by activated Carbon filtration. Due to the suspension of finely divided matter, turbidity can be seen as a lack of clarity or brilliance in water. Turbidity is the measure of light transmission through a sample. It must not be confused with colour, since water might have a dark colour but still be clear and not turbid. Clay, silt, fine organic and inorganic matter as well as microscopic organisms may all cause turbidity. Although closely related with suspended solids, which is the absolute quantity of matter in a sample, turbidity is not equivalent to the amount of suspended matter. If necessary, it might be limited by activated Carbon or ultra filtration. They effect UV transmission by blocking, scattering and absorbing UV light and may also shield or carry within them some microorganisms, which need to be treated. Suspended solids increase the number of surviving microorganisms. Therefore they have to be limited by filtration, coagulating or settling prior to the UV disinfection of the water. To test the effectiveness of our UV reactors, water samples were tested in the lab by culturing water samples taken before and after exposure in seperate petri dishes and allowing them to develop. The before samples on the left show extensive bacteria colony development in the culture medium, but no infection is to be detected in the "after" samples. The water produced complies with all bacteriological standards set for drinking water. The microscopic photographs below on the left show hard minerals typically found in water, which attach themselves to pipes and appliances to form scale. The "after" samples show the conditioned crystals, which have been magnetically charged. The minerals can not attach themselves to form scale. Mercury vapour lamps emit artificial UV-light. CRYSTAL FLOW™ UV-reactors utilize low-pressure monochromatic lamps that emit light of 253,7nm wavelength, which falls closest to the 260/265nm maximum absorption rate which causes damage to germs. The efficiency of a germicidal UV-system (UV-dose) depends on two factors, the intensity and the exposure time. INTENSITY (W/m²): The intensity is simply the output power of the UV-lamp measured in Watt, per unit surface area measured in square meter. For standard low-pressure mercury vapour lamps, UV-intensity drops to below 85% of it's initial output after about 8000 hours of continuous operation and the lamp must then be replaced, as reliable disinfection can no longer be guaranteed. CRYSTAL FLOW™ UV-reactors are equipped with fully electronic lamp drivers, which ensure the useful lamp life to at least 8000 hours and considerably increase the UV-intensity. TIME (s): The residence time, measured in seconds, that the microorganisms spend in the reactor can be described as the time taken for the microorganisms to travel from the inlet-end of the reactor to the outlet. This is calculated from the velocity of the water and the physical design of the reactor. Does CRYSTAL FLOW do installations? No, we manufacture the systems and don't undertake installations. The installation should be performed by a certified trades-person in accordance with the requirements of the local authorities.